Another rubbery, joyful foal from Contessa, by Sir Donnerhall. 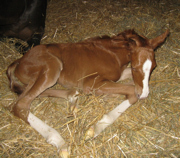 And this one is a blingy chestnut — with white face, 2 high right stockings, and a left hind anklet. Very flashy! And, my goodness, at 3 months old he shed out liver chestnut! I had repeated this breeding to Sir Donnerhall because Contessa’s 2 previous Sir D foals have been just super. And like Tessa’s other Sir D offspring, this colt has a love of movement, and a happy spirit. Sesame is a powerful, elastic mover, and a total delight! Below are a couple videosnippets from “early days”. Pictures show Sesame as a newborn and at 2 months and 2 years old. 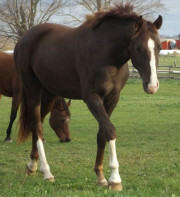 This special colt has been SOLD to a great home in Ontario, Canada. He will be Sue’s dance partner, when Sue decides to give her Wild Honey time off for good behaviour!